Come out to Uptown Realty at 2309 Rio Grande on Saturday February 3rd, 2018 from 2-6pm to cast your vote to crown the Chili Cook-Off Champion! REGISTER HERE to enter the cook-off and compete for $200 first place cash prize and $100 second prize. Take a guided tour with Helena Martin throughout the Uptown office as she showcases her incredible work which will also be available for purchase. Moonchild Mehndi will be offering henna tattoos while you listen to music and enjoy beverages from Tito’s Handcrafted Vodka. 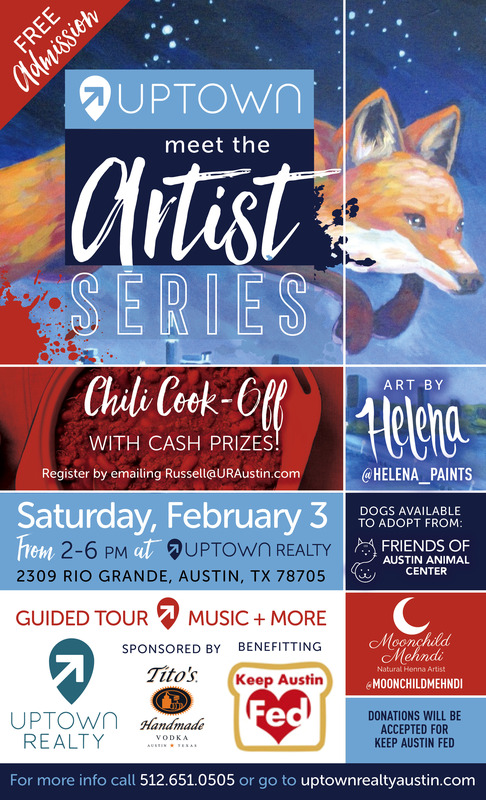 The entire event is FREE with donations accepted to benefit Keep Austin Fed as well as animals up for adoption from the Friends of Austin Animal Center! Based on information from the Austin Board of REALTORS® (alternatively, from ACTRIS®) for the period 03-03-2019 through 04-21-2019 06:27 pm all information provided is deemed reliable but is not guaranteed and should be independently verified. The Austin Board of REALTORS®, ACTRIS and their affiliates provide the MLS and all content therein “AS IS” and without any warranty, express or implied.